This November, during Asian Art in London, our exhibition “The Scholar’s studio” showed a great interest amongst collectors. Very interesting Scholar items manufactured by excellent craftsmen in different material, such as Wood, Jade, Bronze, Porcelain, were in demand at that time, and many of them were included in our exhibition. For thousands of years Chinese scholars, greatly esteemed by their society, who were also collectors of high quality, highly sophisticated art objects—some functional, some inspirational, small enough to decorate a scholar’s desk or complement his study. Our exhibition “The Scholar’s Studio” aimed to represent Literati’s daily life in Ming and Qing dynasty. In the studio the Scholar isolated himself from others, finding the calm necessary for study and contemplation. It was in the studio that he studied Confucian classics, wrote poetry, played music, practiced calligraphy, and perhaps painted. 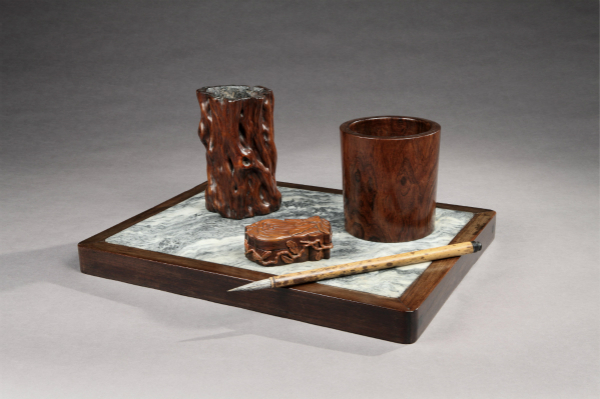 The objects in “The Scholar’s Studio” were created for Scholars, which they surrounded themselves, such as brushes, brush pot, brush rest, water droppers, toggles, figurines, and paperweight—representing the pinnacle of an Art form that was refined over thousands of years by Chinese artisans. These objects embody the highest degree of technical precision and a finely honed aesthetic sensibility. As such, they are still popular nowadays and are favored by more and more collectors. Such like this set of items, a lovely bronze paper weight, an unusual shaped bamboo brush pot, a delicate brush rest with nice brush and a marvelous Qing-style elegant stand are included. You could experience by holding one of our brush pots, and imagine an Eighteenth Century Literati rapidly taking out a brush from it and writing down a famous poem. Scholar’s items are not only decoration of your study but also are functional, and very much in demand nowadays.